The days are rolling so fast into weeks which is getting closer and closer to summer and the holiday season! I was starting to feel the pressure of not having a pair of togs to wear! We’ve taken the kids swimming a few times so far, but I was the guard watching over all our stuff as I didn’t have a pair of togs that fitted me or looked half decent! By now if you’ve been a regular reader of my blogs, you would know the challenges I’ve had with my belly! Between having three massive babies, which caused three large muscle separations, my belly has been left in a bit of a mess. It’s taken a while and lots of hard work, but it’s shrunk in size but the excess skin is too much to bare! 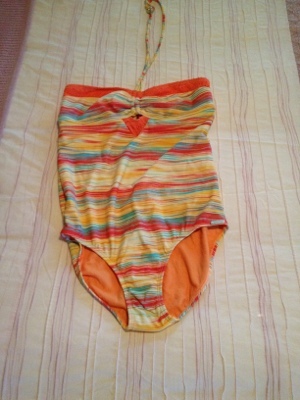 So it’s been a rollercoaster ride to decide what am I going to wear this summer – a one or two piece! I’ve gone with the comfortable option of a one piece! When I’m out swimming and having fun with the kids I want to feel comfortable and I know a one piece will allow this to happen! But as we all know, the choices we are left for a one piece compared to a bikini is the same when you go to buy a baby girl’s outfit compared to a baby boy’s…half the amount! I’ve looked at surf shops, Big W, Kmart, David Jones, online and eBay! I managed to find a nice pair in the Mambo section of Big W on sale for $20 which I bought as an interim pair until I found a really good pair that I loved! 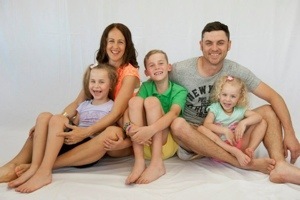 This week the Myer summer catalogue was delivered to our house! I don’t know whether it was the beautiful pair of togs on the front cover that caught my eye first or the 25% off all swimwear – I think my eyes are automatically drawn to a percentage sign lol! Anyway I saw a few pairs in the catalogue that I liked, particularly from the Jennifer Hawkins range ‘Cozi’! So today, without children, I took a trip to the Hyperdome and tried a few pairs of togs on! I even tried on a two piece first which I loved but the loose skin just didn’t do it for me lol! After being convinced a one piece is the only way for me to go, I tried on two different ones from the Jennifer Hawkins range. One I really liked, but the other I loved! It’s bright its beautiful and very flattering on! Plus it has good padding in the bust area which I definitely need lol! They can be worn as strapless or halter neck….I love the colours!!! After a successful tog shopping trip, I went straight home and matched my new pair of swimmers to my swimwear essentials and am happy to be sporting this over the summer period this year:)! 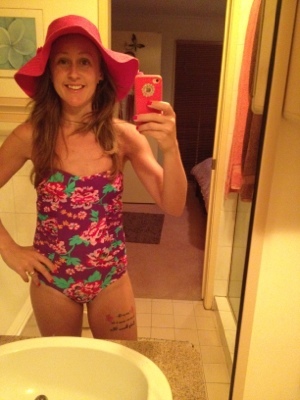 My swimwear essentials…togs, cover dress, hat and havaianas!!! !